The primary function of windows is blocking out the various elements here in Cleveland, from sleet to blazing summer heat. Window panes are a large part of a window’s anatomy. They protect your home 365 days per year and come in two different glass styles: dual pane and triple pane. Dual pane is the classic option for replacement windows. It consists of two panes of glass with a single space between the panes. Triple pane adds a second chamber for increased energy efficiency and sound-blocking technology. Both versions help keep the heat outside in the summer and your home warmer in the winter. The go-to insulator for replacement windows is argon gas. Argon is odorless, colorless, and it’s used to make your window more energy efficient. It is denser than air and typically inserted between the panes of dual pane glass. Argon’s thermal conductivity is 67% more than air—and one of it’s most attractive features is that it’s inexpensive. You can expect argon gas to increase the cost of your windows by 10%-15%. While argon is an excellent option for enhancing the performance of replacement windows, krypton takes energy efficiency to the next level. Krypton is a denser gas compared to argon. It is also a better fit within the smaller chambers of triple pane windows. 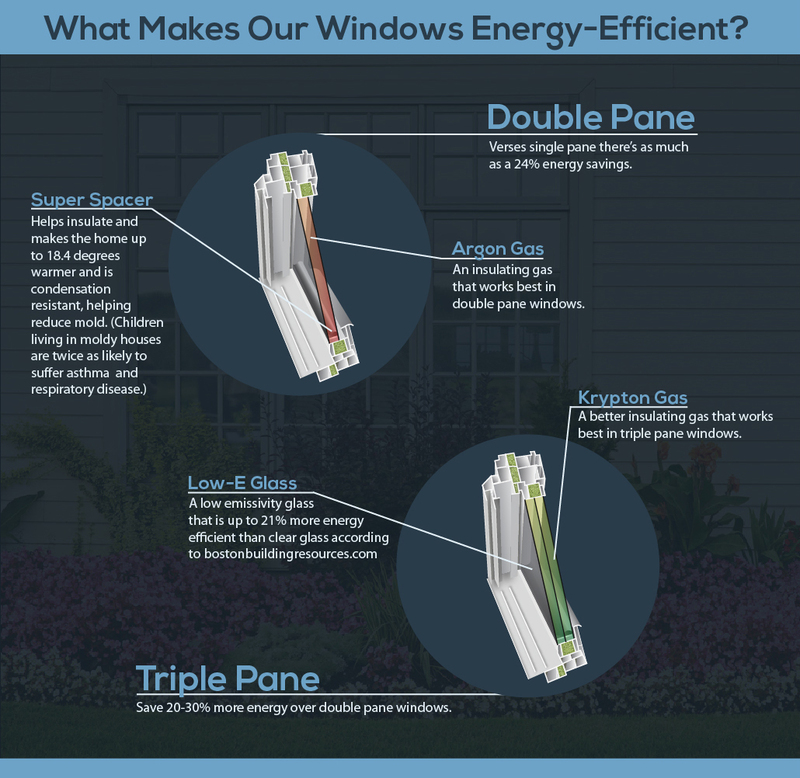 Some of the most energy efficient windows on the market contain triple pane glass combined with krypton gas. These windows can help homeowners save up to $465 per year according to Energy Star. The sun’s rays can take its toll on your windows as well as your interior. Ultraviolet rays through your window fade out flooring and furnishings, but low-e can prevent this and even help make your home cooler. During the summer, low-e is great for solar protection since it reflects the sun’s rays away from your home—think of it as sunblock for your window. And since low-e helps block sunlight, it can also help keep your home cool during the summer. A top-tier performing window needs a seal that provides condensation resistance, UV protection, and saves energy. The SuperSpacer seal isn’t just an ordinary seal in a run-of-the-mill window. This seal excels at keeping your house cool in the summer and warm in the winter. SuperSpacer is so powerful that it can be effective in temperatures as high as 140 degrees, and humidity as high as 95-100%. Who wants to hassle with opening a window for cleaning? Tilt-latches are engineered for smooth operation so you can open your windows without fuss. Want to let in a fresh breeze without worrying about intruders? Sash limit locks block the window’s sash from opening all the way, allowing for partial opening. The True Position Balance System functions so easily that you’ll wonder why you’ve never experienced it with any other window. Balance systems such as True Position Balance System allows for the smoothest, quietest operation possible without slippage. Once the sash is shut, a custom-made groove is provided to secure the sash in place. This secure fit is the perfect solution for both security and energy savings. What more can you ask for from a simple groove? While other companies include the extruded lift rail as an afterthought, the best engineering makes this component of the window part of the sash. This helps the spring catch to fit properly, giving you better overall operation of the window. No homeowner wants to deal with rain or air infiltration making its way through your window’s sash. The cam-style lock reinforces the window’s seal, keeping your home energy efficient and dry. Finally, thermal reinforcements help window chambers fit together flawlessly. These custom-made resin inserts make your windows even more energy efficient, leading to maximized energy savings throughout the seasons. ● Low-Emissivity Glass: Otherwise known as low-e, this glass blocks out UV rays from entering your home. It’s 21% more energy efficient than untreated glass. ● SuperSpacer: Highly efficient insulator engineered to make your home up to 18.4 degrees warmer. Also features excellent condensation-resistant properties, which decreases the probability of mold and mildew growth. This ultimately keeps your family healthier, since children living in moldy homes are twice as likely to suffer from asthma and respiratory disease. You don’t have to sacrifice value for quality any longer. Universal Windows Direct is the premier source of energy efficient windows here in Cleveland. Contact us today to learn more.